These tombstone treat bags are lots of fun. 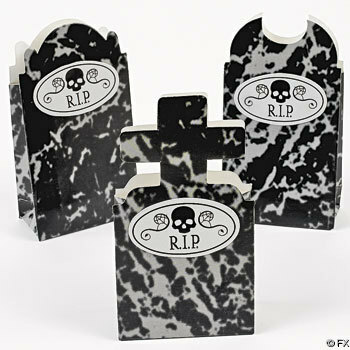 They are made to look like stone with their marbleize appearance and come 3 assorted tombstone styles. 12 goody bags per pack. Create a spooky Halloween table top with these plastic tombsones. They are a great size and nice and lightweight. Perfect for accenting a table of treats and goodies!